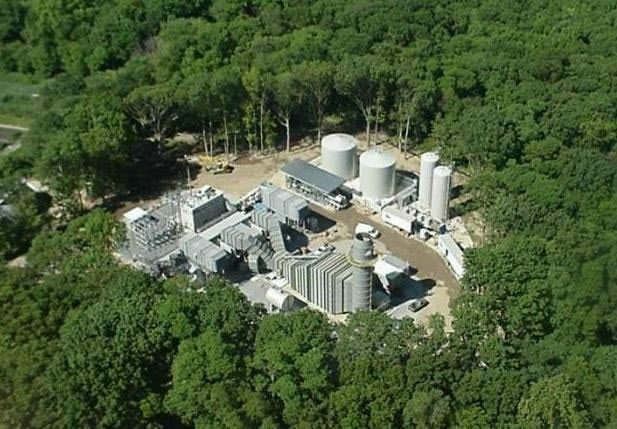 Hawkeye Energy Greenport, owned and operated by the Haugland Group, is a 54-Megawatt, simple cycle combustion Pratt & Whitney FT8 SWIFTPAC gas turbine generating facility located in Greenport, NY. Construction began in February 2003 during one of the coldest New York winters to date. The project was designated by LIPA to be a "fast-track" unit, requiring that the facility be operational by the summer peak period of that year. The Pratt & Whitney SWIFTPAC units were factory-assembled and modular to reduce field assembly and simplify mechanical work, but there was a substantial amount of civil construction to be completed at the site, including foundations and embedded conduit. Weather complications challenged the accelerated pace throughout the project, with the extreme cold temperatures giving way that spring to usher in a record amount of torrential rain. Despite significant ongoing weather-related hindrances, the construction schedule remained on time. Following foundation completion and generator installation, the gas turbine base was assembled, including all enclosures, oil piping, interior piping systems, remaining unit components and the control systems. The testing phase concluded with the system being accepted as operational; and following several test runs, the plant was certified operational and placed into commercial service on July 3, 2003. The entire project – from land clearing to the first fire and commercial operation – took only 93 days; a notable timeline for a project of this size and scope. The generator utilizes proven FT8 technology designed to provide quick, reliable power to Long Island, and has operated flawlessly since going into commercial operation. Haugland Group sells power to the Long Island Power Authority (LIPA) under a long term power purchase agreement.